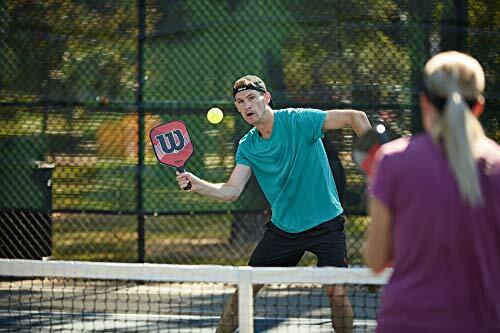 The relatively recent entry into the pickleball market by Wilson Sporting Goods Company…(or just “Wilson” as most people call it) -a leading tennis equipment manufacturer -is a huge testament to the growing popularity of the sport of pickleball. Founded in 1913, this Chicago based company (originally named the Ashland Manufacturing Company) is a very well known maker of sporting goods, especially in the tennis world with a reputation for quality professional level rackets and balls. 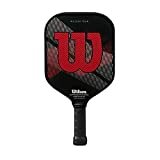 Apart from tennis, Wilson makes equipment for an impressive list of sports including pretty much every racket sport you can play: badminton, racquetball, platform tennis, squash, paddleball rackets and recently introduced its own line of pickleball paddles with the Wilson Profile Paddle being the product we mostly see on the courts. 2018 Update: After we originally reviewed these Wilson paddles they seemed to be on the way out…through 2017, many of them were not in stock in stores nor available online. For some time they were also removed from the Wilson website. New life was injected into the brand when Wilson announced the launch of a new paddle line in collaboration with Engage Pickleball. This is an exclusive partnership between Wilson Sporting Goods and Engage where the paddle will be made in the US in the same manufacturing facilities where Engage makes their paddles. The press release was done in sprithe ng of 2018, and the new paddles are now available including 6 new paddles that we’ve reviewed below. As mentioned above, this new paddle line is the results of an agreement made between Wilson and Engage. All paddles are made in the USA and offer the same quality you’d find in the Engage equipment with the branding and customer service of Wilson. These six new paddles were released in mid 2018 and are just being seen on courts now. Being a household brand name among people that play tennis, racquetball and squash. We expect to see a lot more of these paddles in circulation among cross over players coming from other racket sports. If you are shopping for one of these Wilson paddles, we’re here to try to help you pick the right one. As we mentioned in our guide to buying pickleball paddles, the most important factors to consider are: weight, grip size and lastly the best shape for your playing style (widebody, elongated, long handle, etc). Although there are six new models, Wilson makes the choice relatively easy (or maybe confusing depending on how you look at it). When you look at them they are almost identical (this same issue happens with Head pickleball paddles, lots of models but very similar). 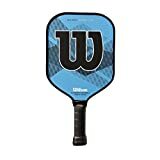 These measurements are classic wide body paddle shape that we see on many of the best selling pickleball paddles like the Onix Z5 paddle we reviewed here for example. 2. All of the Wilson by Engage paddles have the same “Power Comb Technology” polymer core. So what it really comes down to is the weight (also very similar between most of the paddles) and the finish on the hitting face. Because so many of the features are the same, we just have a brief overview below of each paddle showing what is different and which one might be the best for you, depending on your playing style and the weight you prefer. The mid-weight is a good for all around players. The texture of the skin on the paddle and the composite face is designed to help you control your shots (see our top recommendations for “control” style paddles). The textured face also helps you put spin on the ball (Check out our top rated pickleball paddles for spin). This is the heaviest of the product line, this would be good for ex-tennis players that are used to a heavier racket or players looking for extra power on their serve and baseline shots. Marketed as the lite version of the Surge, it would be a good choice if you’re looking for a light weight paddle with the same composite face. If you’re looking for lightweight paddle and small grip like this one – click to take a look at our top picks to compare. See Surge Lite above, this is basically an identical paddle, just different color and graphics but the build is the same. Here is a close up look at the paddle. These are the original Wilson paddles that they made prior to their partnership with Engage, you can still find some of these available for sale online. Going forward, based on marketing and the Wilson website, it appears they will be working exclusively with Engage and the new paddles (see above). 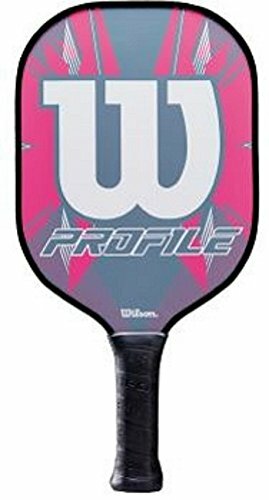 Wilson’s newest offering is the Wilson Profile Graphite Paddle, they seem to be putting all their concentration into this one paddle since it is the currently the lone paddle in the product line. If comes in pink and blue options. It seems to me this paddle is appealing to the “conversion players” coming over from tennis – which is a big percentage of new players as many senior players are trading in their rackets for paddles…. and Wilson does have very good brand name recognition and reputation among the tennis crowd. The weight and feel of the paddle would likely be a good fit for someone converting to the sport but we’ll have to wait and see if this paddle will succeed or go the way of all past Wilson paddles. The Profile is approved by the USAPA for tournament play. Click here to compare to other top selling graphite pickleball paddles. If you are looking for a bag to put all your gear in you’ll want to check out our compete list of picklball bags here. The Wilson Portable Pickleball Net is USAPA approved for tournament play and is the standard 22′ with a height of 36″. The overall design is similar to other portable net systems on the market with interlocking tubular pieces that fit together and can be easily broken down and stored in the included carrying case (thus “portable” compared to permanent net systems that are screwed together and have heavier posts and often times have wheels to move them inside a gym. As far as portable nets go this one seems pretty run of the mill. The tubes that form the base at either end don’t seem very solid to me and leave me less than convinced that this net will last long. The side legs are curved at the ends and double back…to me they look similar to the ends of a coat hanger, but are obviously much thicker. Hard to explain, maybe better just to look at this picture. As per Wilson’s website they claim the benefit of this system is that players will trip less. I can’t really wrap my head around that idea, I’m not sure why a person would trip less over this rather flimsy curved tube rather than a solid steel base. To me they just don’t seem as sturdy as new oval design of the PickleNet By Oncourt Offcourt. So after comparing the Wilson I still stand by the PickleNet as my top pick for best portable net, which we reviewed here. You may occasionally see these paddles for sale online in new or used condition . This was the lightest paddle in the Wilson lineup at the time of launching in 2014. Although in the the video below the company rep mentions a weight of 7.3 ounces, the advertised range of the paddle is is 7.6-7.8 ounces. The one we tested weighed in at 7.8 ounces so still a relatively light paddle. The 5″ handle and cushion grip gives it a tennis racket feel that we’ve come to associate with Wilson. The grip circumference is quite small at 4 1/8″, making it a choice for smaller hands (although many former tennis players are used to building out their racket grips which could also easily be done on this paddle). The Nomex core provides a solid feel while keeping this paddle relatively light. Sold in Blue with LARGE W on the paddle face! 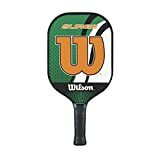 The Wilson Surge would be a good option for players that want the maximum playing area on the face of the paddle and do not want any obstruction from the edge guard (thin plastic protective strip that covers the rim of the paddle). 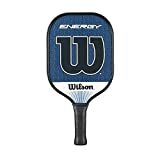 In the lightweight category the Surge outdid the previously launched Wilson Energy, coming in at an even lighter 7.3 oz ( I think in the video above he just confused the weights on the two paddles 7.8 vs 7.3). The Surge features Wilson Power Comb™ technology which their version of a lightweight honeycomb core. The weight and feel of this paddle makes it a good choice for control player who excels at dinking and finesse shots BUT I only recommend this if you really want an edgeless paddle. See article linked above for my opinion on edge guards (or the lack of them on a paddle). The Wilson HOPE paddle is the sister to the Surge. This is the same paddle except for the graphics. This cool project created by Wilson donates money to the Breast Cancer Awareness Fund with every paddle purchase. The specs exactly the same as the last review so we won’t repeat it all again. It’s an ideal weight for most women along with very cool pink design and best of all is that some of the money goes to charity. Updated Nov 2017: It was a cool project while it lasted, although I occasionally see one of these floating around for sale online, the paddle has been discontinued. Launched as Wilson’s top of the line pro level paddle, the Tour BLX introduced basalt fiber weave. It’s the only paddle we’ve seen with this technology although for practically purpose from a playing standpoint it doesn’t really stand out compared to graphite it has similar touch and feel. The paddle weights close to 9 ounces, putting it well inside the heavy category. Although that extra weight will be a welcomed feature for many power players looking to pack some extra punch, it seems the paddle is really banking on the basalt weave technology and I’m not sure that is enough to make this a winner over all the other graphite paddles available now. To get down to the core the guys over at Pickleball Central actually took a circular saw to the paddle and literally ripped it in half to get to guts. Although much of the video is blurry, here are the last few seconds of the video where you can get a better idea of what it looks like inside. Wilson sells a picklball called the “Neon Flare“. The balls are designed so that there is equal distance between each hole and holes of equal diameter. The claim is that this design makes them fly true more than other balls. The balls seem kind of generic, they are marketed as indoor/outdoor balls meaning they can be used on either surface. This is unusual. Almost all pickleball brands sell specific balls for indoor and outdoor with the balls being slightly different . For example most outdoor balls have 40 holes while most indoor balls have 26, they have more holes for better flight in windy conditions. Also outdoor balls are normally heavier, harder and have smoother plastic surface compared to indoor balls. So it seems weird that Wilson just came out with one all around ball that’s supposedly ideal for all conditions. 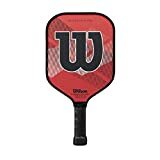 My recommendation is to let these Wilson pickleballs bounce on by and head over to our complete ball buyers guide to see our top picks for best indoor and outdoor pickleballs. 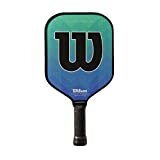 Wilson Champ Graphite Paddle (DISCONTINUED). Paddle is no longer available on the market.